Looking back at Greyling Lake from one of the upper ridges. By the mid-70’s I had taken two 40 inch rams the largest scoring 167 B&C points missing the Boone & Crockett Record Book by only three points. I had also taken a ram with my bow scoring 157 P&Y points placing him in the top three in the Pope & Young Record Book. Not bad for a guy without an airplane, limited funds and not much spare time. I think it’s even harder to do now-a-days with the lower sheep population. I know a couple of sheep hunters with airplanes that take off the whole month of July just to spot for big sheep and then spend most of the season chasing them. Most of these guys have at least one record book ram. It is just a fact of life, if you devote enough resources and time you can find a big ram. That being said I continued to hunt sheep doing walk-in hunts on the weekends and taking leave whenever possible. It was August 1979 and my Air Force unit was being inspected by the Inspector General (IG) so I couldn’t take my normal leave for an early sheep hunt. After receiving an Excellent Rating we were back to normal. I went by Brent’s taxidermy shop to see if anyone had taken any big rams during the first two weeks of the season and Brent told me a story about a non-resident hunter who had taken a 46” ram while hunting with Earl Payne. Danny Wattley, the guide who was buying Earl’s area, was also involved. The hunter had told Brent of a similar ram in the area. Brent thought I might be interested in checking out the area so he showed me on the map the area around the Tonsina Glacier. Earl had taken some nice rams in the past but none that big. I was for sure interested. When I got home I called Lyle Thompson, one of my current hunting partners and my Squadron Commander at that time, to see if he wanted to go. Lyle had hunted sheep with me the past season but didn’t take a ram. He was “chomping at the bit” to go so we made plans to do a five day hunt the following week. I called Ken Bunch, owner of Gulkana Air to see if he could drop us off at Greyling Lake, a high elevation lake that gave us access to the mountains around Tonsina Glacier. He said he had been in there a few times before with his Cessna 185 and with only the two of us it would be no problem. We scheduled the flight so the hunt was officially on. 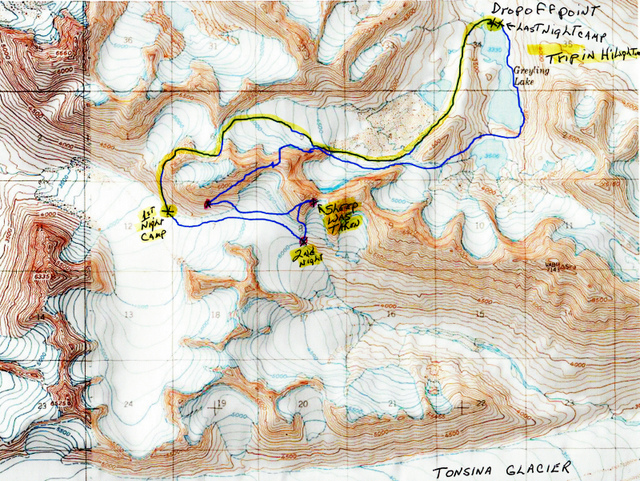 My plans after landing in Greyling Lake were to go up and over the mountains between the lake and Tonsina Glacier. There are numerous hanging glaciers in that area and I knew it was going to be a tough go. Map of the area. We started from the far end of Greyling Lake and traveled southwest. It was a gorgeous fall day as we drove to Tolsona Lake, the float plane base of operation for Gulkana Air. We arrived early and waited for Ken. He returned around one o’clock and we loaded up the Cessna 185 and were on our way. It was a short flight into the rugged Chugach Mountains. Greyling Lake is a beautiful little glacier fed lake surrounded by craggy mountains with hanging glaciers and snowfields. We unloaded the plane and Ken was on his way. There is something magical about the smell of fall air in the Alaska mountains and the anticipation of what was to come later was truly exciting. Ken dropped us off close to the mouth of the lake but because of the water level, it was on the opposite side of where we wanted to be. We had to cross at the mouth someplace. Initially the mouth was 50 feet wide and the water looked to be about a foot deep but as the elevation dropped off it became a very swift 20 foot wide creek. We walked down stream close to half a mile but couldn’t find any place where we could safely cross without getting wet. I hate starting a trip off wet. We came back up to where it was flat and I could see that the bottom looked muddy. Since it only looked to be a foot or so deep I thought we could take our boots and socks off and roll up our pant legs and wade across. If I had known that we had to cross the water I would have brought tennis shoes or some other type of boots. We sat on a rock and took off our mountain boots and socks, rolled up our pants, put on our packs and crossed the water. The mud was gooey and slippery between our toes as we crossed the icy water. At the time it didn’t seem that bad. Once on the other side as we were drying off our feet we noticed some blood. We had both cut our feet on the sharp rocks under the mud. Because the glacier fed water was so cold it numbed our feet almost instantly so we couldn’t feel being cut. Most of the cuts were minor but not what you want when you are getting ready for five days of climbing mountains. I never repeated that mistake again! Now all we needed to do was to find a way to get over the mountains. We worked our way around some of the cliffs and hanging glaciers staying on the snowfields whenever possible. There was a great deal of finger nail climbing and ropes would have been nice in some of the more vertical areas but we made it without them. We climbed up about 2500 feet in elevation and dropped down about 1500 feet on the backside in our five scale mile trip. We never spotted a ram until we dropped down on a fairly large glacier running the opposite direction from the Tonsina Glacier. It was a tough five hours. The glacier that we used to travel on. We reached the glacier about 9 PM. As we were glassing the opposite side of the glacier I spotted two rams lying on top of a ridge above an extremely craggy mountainside. After checking them out with my 15x60 Bausch and Lomb spotting scope one looked to be at least a 40 incher. It was too late for a stalk and, they had already spotted us. We stayed behind some of the larger rocks in the rock pile by the edge of the glacier. After an hour of watching them I decided it would be best for us to stay under cover and camp there in the rocks and hope the sheep would still be there the following morning. Right at last light the rams got up and moved further up the glacier staying on top of the ridge. I must say that was the worst camp spot that I have ever picked. I have posted the photo. To say the least it was a very miserable night. Lyle relaxing on our first night in the rocks out of sight of the sheep. Bad camp!! Between 5 and 6 AM we got up and ate our fabulous oatmeal breakfast. We sat in the rocks and glassed for an hour or so. There wasn’t a sheep to be seen. Somewhere around 8 AM we heard the sound of a helicopter coming our way. He was high but the “whop whop” of the rotor was a noise that I knew animals didn’t like. He flew above the ridge where the sheep had been the night before and after a few passes he finally landed on the ridge. He turned the engine off and two guys got out. I couldn’t see what they were doing and at one time I thought they might be hunting but after about fifteen minutes they took off and went about a mile up the glacier and landed on another ridge. This went on all day long. They would go from ridge to ridge, landing then taking-off again. No wonder we hadn’t seen any rams and any that we did see were on the top of the ridges and moving. It was the worst thing that could happen to a sheep hunter and especially a bow sheep hunter. It takes a sheep days to get over close helicopter traffic. I assumed they were doing some kind of surveying but why would they do it during sheep season? To say I was upset would be an understatement. Me traveling on the glacier. If you look close you can see my instep ice cramp-on's. We pulled camp and moved up the glacier a couple of miles to where it crested and started down into the right fork of the Tonsina Glacier. We found us a good glassing point where the glacier touched the slope of the mountain. I couldn’t believe this was happening and we still had three more days to hunt. We hung around there the rest of the day talking bad about who might be responsible for the helicopter flights. We spotted sheep in the distance but they were all high on the tops of the peaks. Day three was a bit overcast and there wasn’t any helicopter noise. After lunch we spotted a ram back to the north just below the ridge of a small glacier bowl. The surrounding area was jagged cliffs and other bad rock outcrops. He moved around to our right and disappeared. We knew he was legal and it looked like we could climb up to our right and stay out of the worst of the cliffs. After two hours of hard climbing we made it to the ridge. We took a long break and then moved around the ridge the way that the sheep had gone when he disappeared. It wasn’t long before we spotted him about 400 yards out eating rocks (just a joke) but that was all I could see that he could be eating. It looked like we could move from boulder to boulder and get within 200 yards of him. We looked him over carefully and I guessed him to be a “broomed” 37-38 incher. The next thing we knew he had turned and looked back at us. Lyle was set-up and with a steady squeeze he hit the ram in the shoulder and it disappeared over a cliff. We jumped up and made our way over to where we had last seen him. Approximately 500 yards down the mountain in a snowfield lay Lyle’s ram. We did a high five and Lyle said, “Now what?” I said, “We go get him,” knowing it wasn’t going to be easy. We moved slowly down the steep slope. When we made it to the snow or ice field there was a break or opening between the dark mountainside and the snow. This was caused by the melting of the ice next to the dark rocks. It was only two foot across but we were on a 65 to 70% incline and so was the snow. We would have to jump across to the snow and hope we would stick and not slide down the mountain. Without saying anything I jumped and sank about two inches in the snow which was all that I needed. I looked back at Lyle and he said, “I can’t do that!” I replied, “You have to, it’s your sheep!” It took a little while for him to get his nerve up but then he jumped. He said, “That wasn’t that bad.” I said, “I know but I’m worried about jumping back across with the extra weight of the sheep.” We would have to cross that bridge later. The closer we got to the sheep the less steep the snow became which was good. Lyle and his ram on the snowfield. Lyle with his ram again. It was only 6 PM so we had enough time to get everything done and make it back to the other side of the mountain before dark. We took pictures, skinned the sheep, boned the meat and divided everything between us and then loaded our packs. The ram was a dandy nine year old “double broomed” 37 1/2 incher. A great first ram. The clouds were coming down and contained a fair share of moisture. 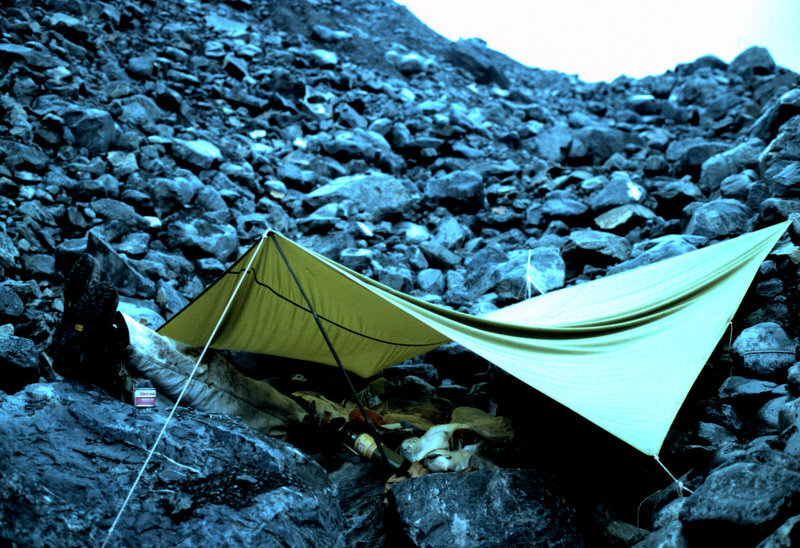 We needed to get off of the snowfield and on the other side of the mountain at a lower elevation to make camp. The only real obstacle was jumping from the snow to the rock/gravel mountainside. It took us a few minutes to find the best place to jump but overall it wasn’t too bad, more psychological than physical. By 9:30 PM we were on the other side of the mountain looking for a good campsite. By dark we had found a semi flat spot with a small water source. Life was good! Back on the other side of the mountain from where Lyle harvested his ram. The following morning we sleep in listening to the rain hit the tarp. It stopped raining by mid-morning so we got up and Lyle picked some fresh blueberries for our oatmeal. We glassed a couple hours and seeing nothing of interest decided to head back over the mountain to Greyling Lake, our pick-up point. Late that evening we were setting up camp on a real flat spot in some nice green grass. It is sweet when you make it back to your pick-up point especially when you have a nice ram like Lyle’s. Lyle and me back at Greyling Lake. You can see the hanging glaciers in the background. Map of the trip. The up and over trail is hi-lighted. Rough country. Looking at the map and knowing what we did I truly don’t know how we did it. That was one of my most dangerous sheep hunts and in fact both of my sheep hunts with Lyle were brutal. He always hung in there and thought I was trying to “kill him” and even told me that one day. I will say God was with us all the way always watching over us. Thanks Lyle for some great memories, you made it a blast my friend. Let’s go sheep hunting! !